If you are thinking of moving to Hosted Microsoft Lync you may be thinking: Can I ditch my GoToMeeting account? Yes, yes you can. Ongoing Operations firmly believes in using the solutions we deliver. In mid-2012 we switched entirely from GoToMeeting to Microsoft Lync. Cold Turkey. Prior to the switch we paid hundreds of dollars every month and loved GoToMeeting. As a virtual company – collaboration and online meetings are key. Our team of experts had between 5 and 10 GoToMeeting accounts and would do product demonstrations, powerpoints, webinars and conference calls using the product multiple times every day. At first there was some resistance – but now none of us can imaging going back to it. Ultimately, I don’t believe it has all that much different functionality but it comes down to ease of use and cost. Cloudworks’ Hosted Microsoft Lync, part of the Collaboration Suite, makes communicating with clients, remote workers, or anyone very simple and affordable. Now instead of using three or four different products to do video, chat, voice, screen shares, remote presentations, or demonstrations you can just use Hosted Microsoft Lync fully integrated with Hosted Voice and Hosted E-mail. Streamline your collaborations and customer interactions quickly and easily. 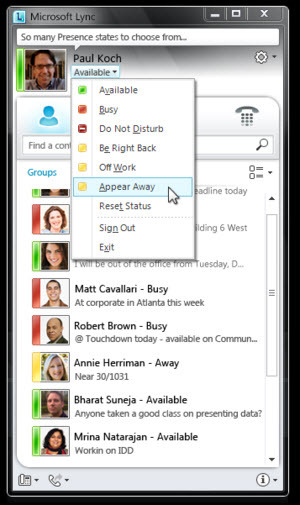 What can Microsoft Lync do? Hosted Microsoft Lync is fully integrated with the Cloudworks Cirrus Portal too so adding or removing users is as easy as a quick check box. As opposed to Lync, GoToMeeting is primarily a video conferencing suite that makes it easy to meet, present, and collaborate. this it does VERY well. You can participate in meetings from your desktop, iPhone/iPad, or Android device. However, it does not have any of the other collaboration features of Hosted Microsoft Lync. Pros: A very good one click solution for Video conferencing. Advanced options around screen and application sharing. Decent integration with Outlook. Cons: No other collaboration features outside of Video Conferencing. Pricing: $49/mo (First month free is free.). No contract required. Cancel any time. Enterprise plans available. Desktop Sharing: Yes – Share your desktop with meeting attendees for presentations and collaboration. You can share your whole desktop, or a specific application window. Desktop Recording: Yes – Record your screen and the audio teleconference for playback at anytime. VOIP: Yes – choose between your computer’s mic and speakers, or your phone. Control Granting: Yes – give control of the meeting to anybody in attendance. They can share their desktop and documents using the same controls as the meeting organizer. You can also take control of their desktop to provide support, or do a product walk-through. Video Conferencing: Yes – HD Faces. High definition video allows you to see meeting attendees. Chat: Yes – Group and private chat. Send a message to everyone in the meeting, or select a specific person to chat with. Annotation Tools: Yes – Highlight, draw, and point to anything on your screen. Benefits of using a Hosted Microsoft Lync instead of hosting it yourself?